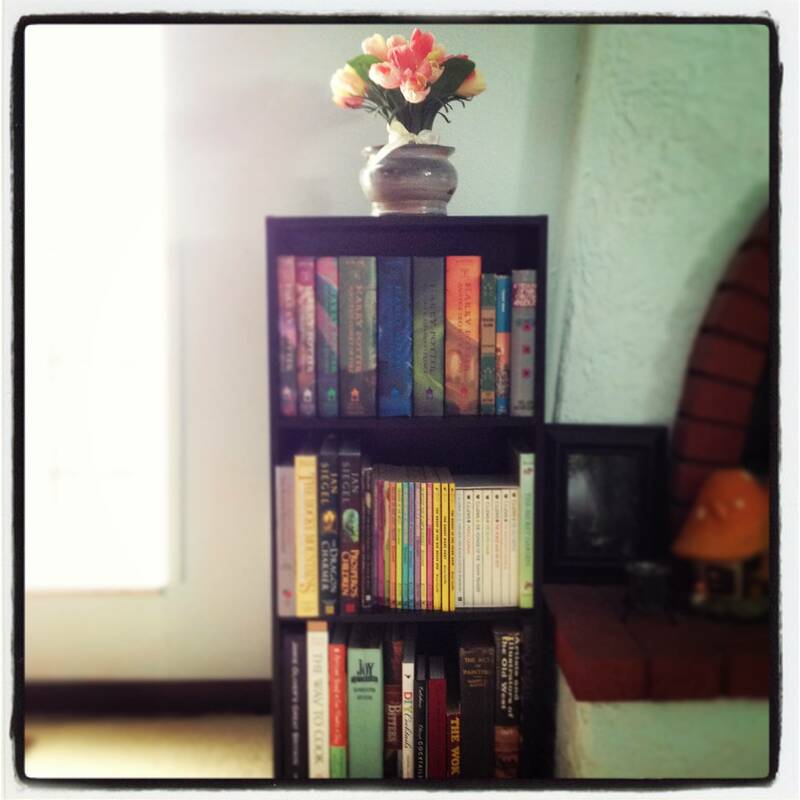 It is a truth universally acknowledged that a bookshelf newly obtained and filled must be instagrammed. But what are the reasons to own books? What makes people hold on to some books and not others? Some people think the possibility of rereading is the only justifiable reason for keeping books after you’ve finished them. I personally am a huge fan of rereading novels because a good book will reveal more of itself every time you pick it up. Back when I was a kid there was no way my parents’ book budget could keep up with my reading pace and I regularly reread books, especially during the summer. I think the book I’ve reread the most times is either Night Train to Memphis by Elizabeth Peters (my mom owns that book, but she did buy me my own copy when I went to college) or The Vampire Diaries by LJ Smith, which I was absolutely O-B-S-E-S-S-E-D with in middle school. I always reread the entire book, but I know other people who just reread their favorite parts and call it good. Other bibliophiles never reread books. My mom is one of those people, yet she still owns every Elizabeth Peters, Mary Stewart, and JRR Tolkien book ever published. She keeps those books because she loves them. Confession: I’ve never reread my favorite book of all time, Jane Eyre. I suppose I’m frightened if I do, it won’t be the same as that one, perfect experience of reading it for the first time. But that doesn’t mean I don’t want to own a copy of my favorite novel—or three or four, but preferably the original. Because even if I can’t recreate the experience of that perfect book, it’s easier to remember if I have that specific copy. Sometimes we buy books that aren’t our thing, but maybe we wish they were. Like once I bought Brideshead Revisited at a library booksale. Am I ever going to read that thing, considering I refuse to even watch the movie? Nope. Probably not. But hey, you never know! I might get to it eventually, right after I read about the first visit to Brideshead. In my experience, library sales are a great way to stuff your shelves with these type of books. 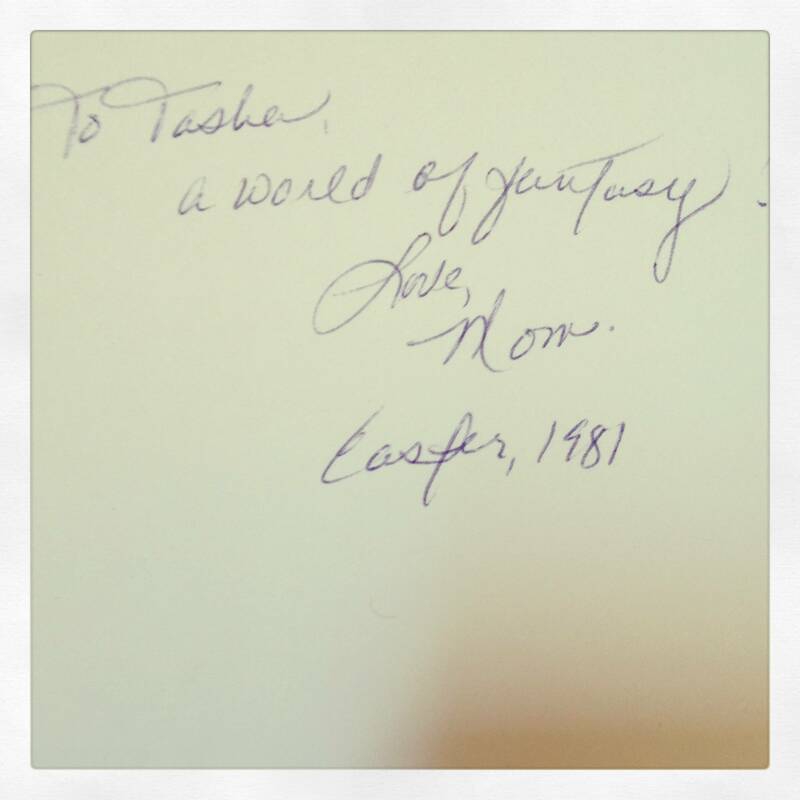 Inscription in a copy of Grimm’s Fairy Tales my mom “gave” me when I was less than a year old. When you get a book as a gift, you’re kind of obligated to keep it, especially if it’s from someone in your family. Really this isn’t a big hardship, and I think demonstrates how books can tie people together. This is true even for non-readers: I insist on giving my brother a book every Christmas, because I’m stubborn like that, and he’s kept every single one even though I have my doubts he’ll read most of them. Whether they’re first editions, signed, or family heirlooms, some books are too valuable to let go of. And value doesn’t have to mean monetary worth: a book I’ll probably never give away is a silly romance novel I didn’t like, but my mom slipped a note into on the first day of my first “real” job. Books aren’t just repositories of words and facts, but can carry memories and hopes in their pages. Maybe retaining some ownership of all those things by keeping books is as silly as Socrates believed, but personally I think there are good reasons to own and treasure books.